Thinking of going to Bayeux France? Perhaps before planning your trip to Bayeux France, you should plan all your exciting activities in Paris first! Do that with the help of our 4-Day Paris Itinerary! Bayeux’s past seems, in many ways, to be defined by war. From the famous tapestry depicting events dating to the Norman conquest of England to its proximity to the famous World War II D-Day landing beaches. While it’s impossible to forget these sullen events, Bayeux is anything but gloomy. The charming old town, that miraculously came out of World War II unharmed, is lovely and home to a famous wooden water wheel. Taste the local Norman cuisine at one of the city’s many delicious restaurants. 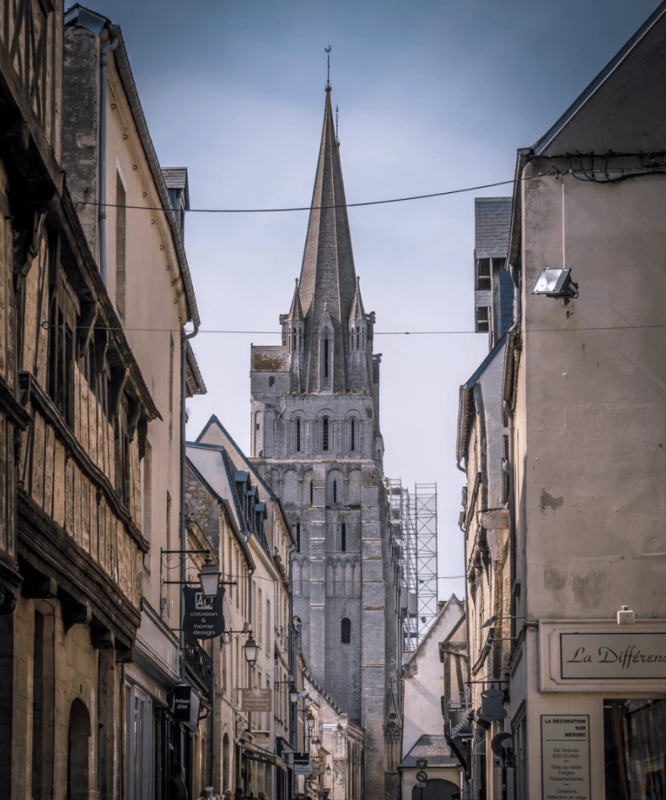 Don’t miss Bayeux France while you visit Normandy. Today, it’s a picturesque town that attracts historians and tourists from all over the world. We do recommend one of the many guided activities and tours in Normandy. Knowledgeable, local guides can expertly explain the events and impact on both a local and international level. Additionally, its location makes Bayeux France a great base for visiting the rest of Normandy. This guide will tell you the weather in Bayeux, what to do in Bayeux, and how to travel from Paris to Bayeux France! We’ve even included a list of the best restaurants and hotels in town. We definitely recommend avoiding winter for a trip to Bayeux, unless you don’t mind the cold! The weather is best from June to September, especially if you are planning on visiting the D-Day beaches. The spring and fall are also nice times to visit, but it can get cold and there is often rain. We recommend spending a full day in Bayeux France. You can spend the morning discovering the town and grab lunch at one of Bayeux’s great restaurants. Use the afternoon to go out on a tour of the D-Day beaches or explore the Norman countryside. It’s home to some lovely boutique hotels and is an ideal place to spend the night during your time in Normandy. Bayeux France is a pretty relaxed town so there is no specific dress code required. We recommend dressing comfortably as you might do a lot of walking. Being on the coast, it can get pretty windy, especially at night. Bring layers if you’re going to visit the D-Day beaches. Because of Bayeux’ proximity to the northern coast of France, winds can be quite strong and the skies are often dark with with some rain. But expect summertime (June to mid-September) to be sunny and warm. Here’s the updated weather forecast for Bayeux France this week. 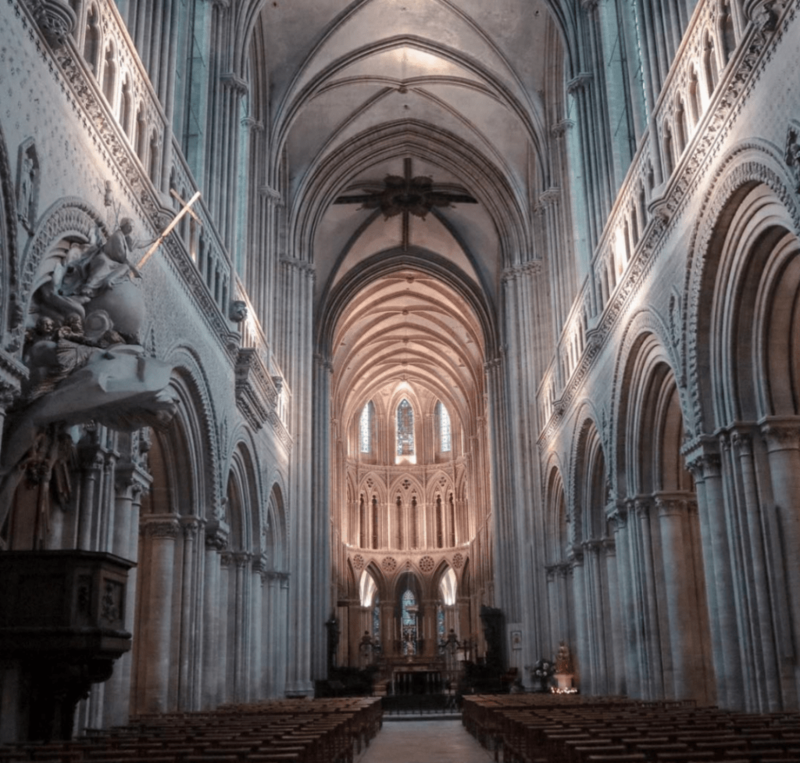 It’s hard to miss the Notre Dame Cathedral of Bayeux France. Sanctified in 1077 in the presence of William the Conqueror, the massive structure combines medieval and gothic architecture. It was the setting for the oath taken by Harold II that he would marry William’s daughter. An oath that would later be broken and set the stage for the Battle of Hastings. Over 950 years old, the Bayeux Tapestry is one of the most famous tapestries in the world for its length and intricate details. 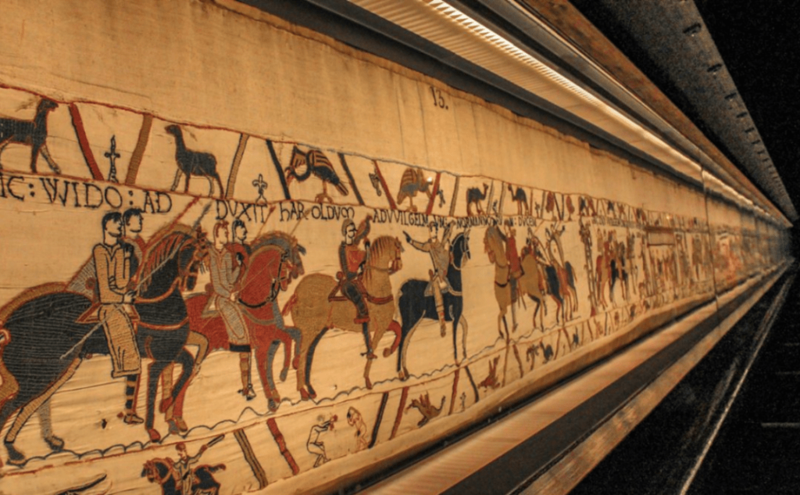 After being displayed at the cathedral for a long time, you’ll now be able to see it at the Bayeux Tapestry Museum (also known as Musée de la Tapisserie de Bayeux). The tapestry that depicts the events leading up to the Norman conquest of England measures a staggering 70 meters long and 50 cm high. It is absolutely worth seeing as it is an important piece of history that reads like a cinematic storyboard for an epic saga! We highly recommend getting the free audioguide that describes in details each of the panels that make up the tapestry. Visit the website here for more info. 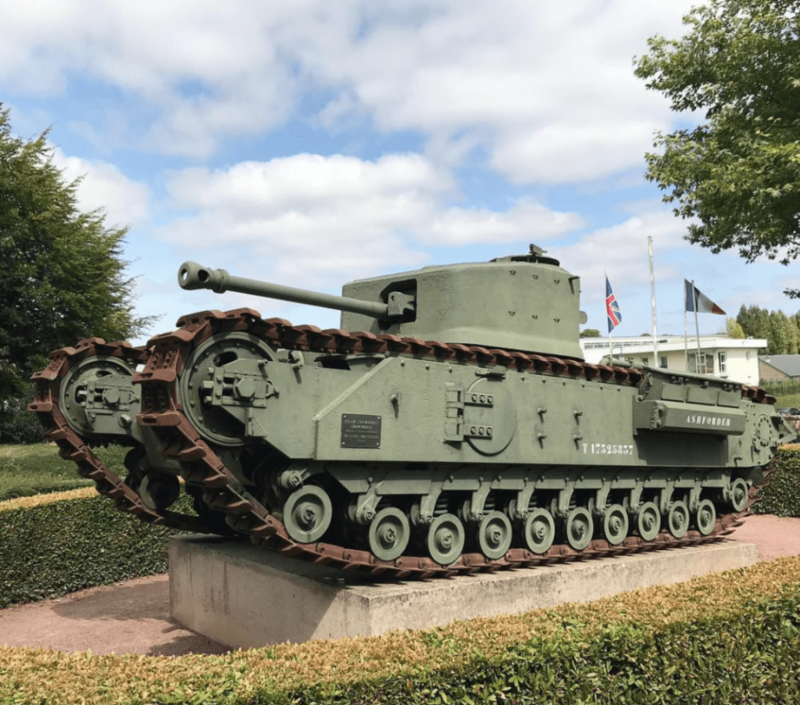 This museum (also known as Musée Mémorial Bataille de Normandie) serves as your gateway to the D-Day beaches. Spanning over 2,300 m2, you’ll be able to immerse yourself in the historic Battle of Normandy. The museum has a large collection of military hardware used in the Second World War on display as well uniforms and items. You’ll also find a large number of maps, audio, and video material that’ll help you follow the day-by-day progress of the Allied invasion. You can buy combination tickets for the the Memorial Museum of the Battle of Normandy and the Bayeux Tapestry Museum for only €12.50! Find the other available combination tickets here. 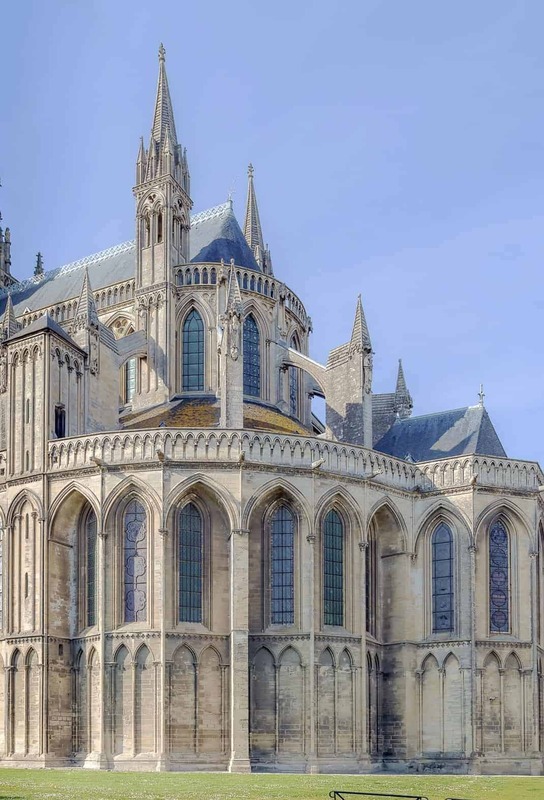 For more information about the town as well as reservations for guided tours, we recommend visiting the local tourism office of Bayeux France. 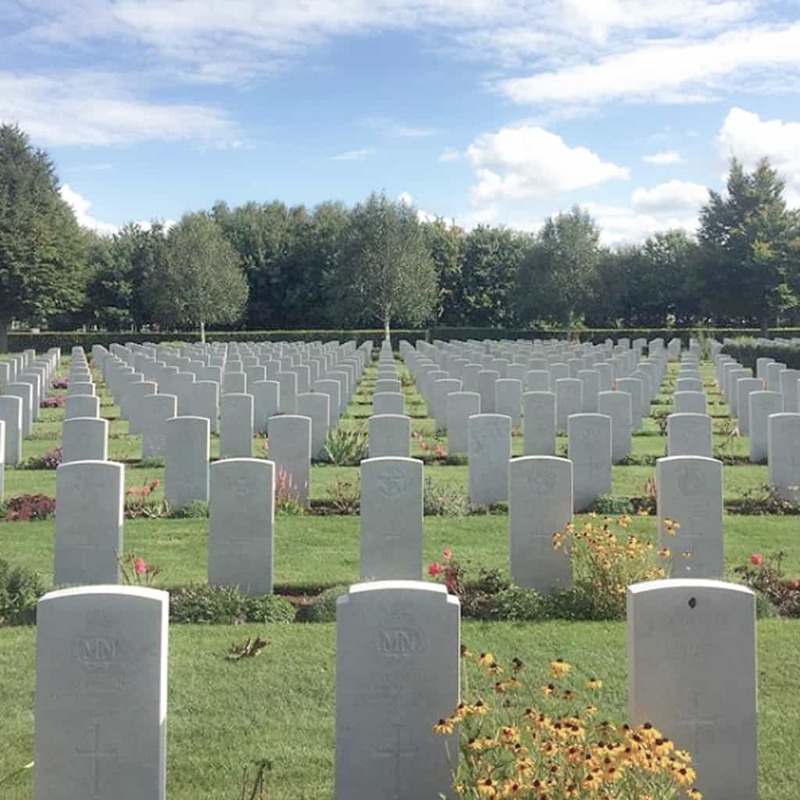 The Bayeux British War Cemetery (also known as the Bayeux British war cemetery) is the largest cemetery in France dedicated to commonwealth soldiers who lost their lives in WWII. With over 4,500 graves, this solemn site is a tribute to the area’s history and pays respect to the thousands who fought in the conflict. Visit the area to pay respects or remember the events that took place here. Visit this website for more info. 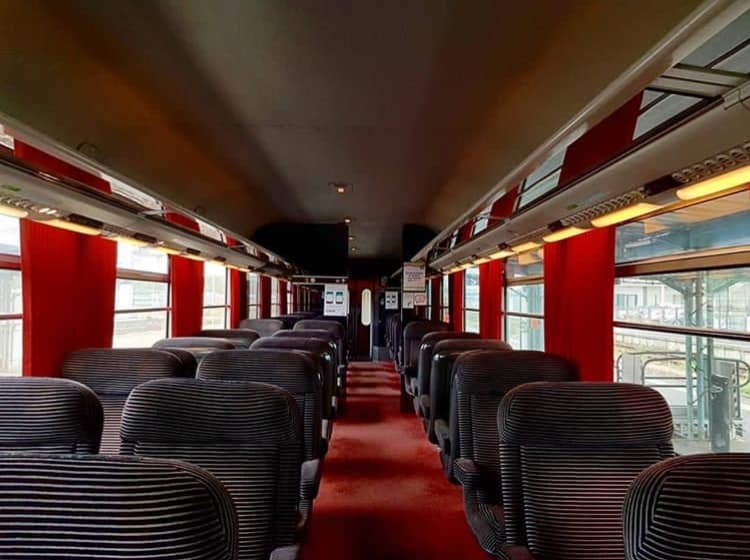 For most travelers from overseas, taking a train from Paris to Bayeux France would be a convenient option. You can simply go to Paris Gare St.-Lazare, which is in the center of the city, and purchase your tickets there. A good way is to also reserve your tickets online especially if you’re traveling in a group! Buying tickets in advance will also mean cheaper tickets. Luckily, there are trains almost every hour from Paris to Bayeux France starting from 7:00 am. It’s important to know that between Paris and Bayeux, you must change trains once at Caen station. Book your train tickets here. We also have a complete guide to purchasing your train tickets online! While taking the train from Paris to Bayeux France is certainly convenient, it can be quite tiring especially since it’ll require getting up very early to catch the train, change stations and then needing to do it all over again in reverse at the end of the trip! We think that a more relaxing option would be to drive all the way to Bayeux. You can go at your own pace and stop as often as It’s not only relaxing but you’ll also get to enjoy the scenery of northern France which is vastly different from that in the south! Check out our complete guide to renting a car and driving in France.